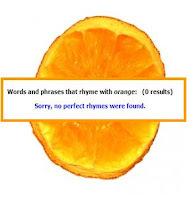 Even Rhymezone can't handle orange. 2. I enjoy reading rhyming picture books to my children. 3. Some rhyming picture books sell, because I've read a few hundred. 4. 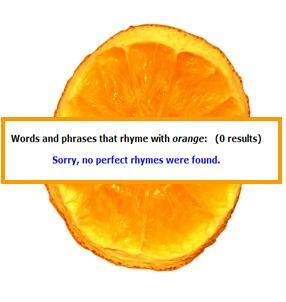 Rhyming is not illegal. I can rhyme anywhere I want. Any time I want. With anyone I please. That said, I understand rhyming rules have been created to protect us novice rhymers. Those in power don't want to be responsible because some new writer gets horribly stuck in inverted speech (they all still feel guilty about what happened to Yoda). I empathize with the rule makers who don't want to be called "enablers" for letting lazy writers get away with "near rhymes." I submit to those rules, because rhyming stimulates a part of my brain prose can't access. So even if I can't publish in rhyme, I sure as heck (or there I am going to the devil again) am going to keep practicing rhyme. So go ahead and tell me your fancy pants rules about not rhyming in picture books, and I will say to them: I think, therefore I rhyme. With Eminem by the limes. You think I'm mentally stable? Watch me flip this frickin' table! Do you secretly rhyme, but not want to admit it publicly? It's okay to tell me in the comments; all rhymers are welcome here. My name is Romelle and I am a rhymer...okay, not really. I am a rhymer wannabe. Welcome Romelle! Feel free to rhyme if you please. We have the perfect spot for rhyming wannabes. This is perfect for a children's book author. Forget what "they" say. Dr. Seuss is a rock star and he rhymed in almost every book. Death, taxes, rhyme - all unavoidable. Rhyme is the only one that is enjoyable! OK, I'm working that one into a blog post someday! You are right Cathy - it's not just a tendency for children's writers to rhyme, it's unavoidable! Now, I see all of my attempts to resist its lure were futile. For some reason these days there's lots of rhyme hate. I suspect that this trend will not soon abate. Nice. Why doesn't "abate" get more play in picture books? "Tommy abate your constant poking me in the ear with a wet finger!" That rolls off the tongue so much easier than "Tommy no more wet willies!" I have rhyme envy! I have tried, and failed miserably, but Lauri, I'll read your rhymes any day! Keep rhyming and give Eminem my best! I'm texting him right now. I know you can rhyme. It just takes patience and a ridunculous amount of work!! I actually like the rules - I don't want to be caged in, but I don't mind a framework to work in. It defeats the little voice inside you who says "this is good enough, right?" Wait, you can't rhyme in adult poetry any more either? Ugh. I suppose you have to wear black and be moody and sit in Starbucks all day to write poetry too? Too many rules!